Towson won the Golden Grizzlies Invitational in Rochester, Michigan, this weekend to remain unbeaten following the team’s 3-2 victory against Oakland Saturday afternoon. Juniors Jocelyn Kuilan and Anna Holehouse led the way for the Tigers (14-0). Kuilan, who was named the tournament MVP, recorded 41 kills, 14 digs and five blocks over the weekend. Holehouse registered 65 digs and 14 assists throughout the event. Junior Carola Biver also impressed, putting up 29 kills and 36 digs over the weekend. All three players were named to the all-tournament team. In the Saturday afternoon matchup against the Golden Grizzlies (5-7), Towson battled to a 22-22 tie in the first set before closing the set 25-22 to go up 1-0. The tight competition continued in the second set with 10 early lead changes taking place. An error by the Golden Grizzlies ultimately pushed the Tigers to a 25-22 win and give them a 2-0 advantage. Oakland continued to fight, though, as they came back to capture the next two sets, 25-17 and 25-19, tying the match 2-2 and forcing a fifth set. Towson jumped out to a 5-0 lead behind a kill from sophomore outside hitter Annie Ertz and four unforced Oakland errors. Oakland battled back to make it 9-7, but a service ace from freshman defender Camryn Allen and a kill from Kuilan gave TU a 3-2 victory. Four Tigers recorded double-digit kills. Kuilan lead the way with 11, while Ertz recorded 10 kills and 12 digs. Sophomore setter Marrisa Wonders contributed 28 assists and Holehouse added 24 digs in the match. Towson swept the first match of Saturday’s doubleheader against Kent State (1-9) in straight sets 3-0. The Tigers captured the first set 25-10 behind four kills to end the set by Junior Olamide Sonuga. 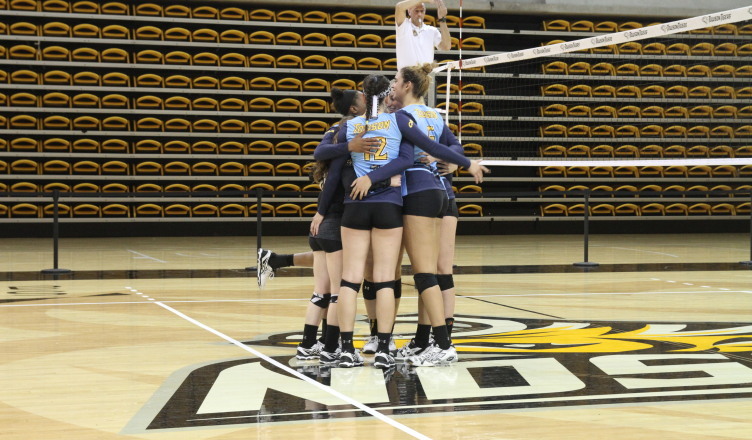 The second set was more competitive, but Towson edged past Kent State, 26-24. The team closed out the final set 25-20 on a kill from senior Julymar Otero to sweep the competition. Biver and Wonders led the way for the Tigers with double-doubles. Biver had 14 kills and 15 digs while Wonders recorded 27 assists and 13 digs. Towson began the weekend Friday night with a 3-1 win against Fort Wayne (7-6) that included 32 ties and 13 lead changes. The Tigers won the first set 25-23, before dropping the second set that went into extra points. With the match even at 1-1, Towson took the next two sets 25-22 and 26-24 to win. The Tigers are one of seven Division-I schools who remain undefeated, including fellow Colonial Athletic Association (CAA) member James Madison (9-0). Towson returns to competition on Sept. 22, as the team opens CAA play against Elon, followed by a trip to William & Mary on Sept. 24. Featured image courtesy of file photos by Jordan Cope / The Towerlight.